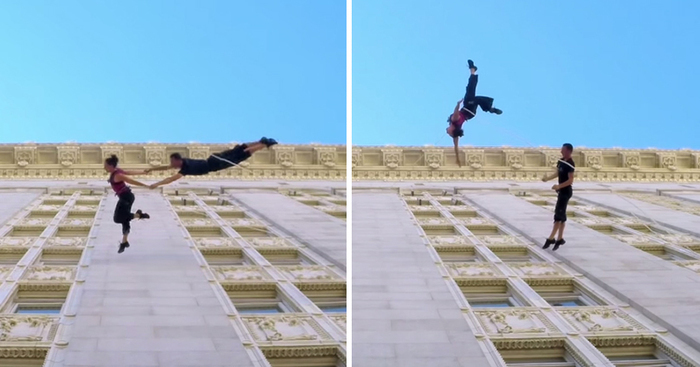 Amelia Rudolph and Roel Seeber, two innovative dancers from the Bandaloop dance company, recently performed an extraordinarily graceful “Waltz on the Wall” suspended on the side of Oakland’s City Hall for the city’s annual Art + Soul festival, twisting and trning effortlessly over the heads of their spectators far below. The Bandaloop dance company specializes in suspended or vertical dance, which gives its dancers unprecedented freedom to effortlessly glide to the air as if they were dancing on the moon. The first-person perspective, captured with GoPro cameras, makes the video all the more thrilling – you get to see just how high up the dancers are as they make their astounding aerial maneuvers! i think it's amazing. and i like Amelia's comments...adds some realness to it...just two human beings DANCING ON THE SIDE OF A BUILDING!